The terse UN statement announcing the failure of the second round of the Mont Pelerin talks, for which there had been high hopes, passed the responsibility of breaking the deadlock to the two sides. “The two sides have decided to return to Cyprus and reflect on the way forward,” the brief statement, free of the usual positive spin, concluded. Is there a way forward? There could be, but this would depend on the two leaders rediscover-ing their spirit of goodwill, which appeared to have been lost in Switzerland. The trust they had built over 16 months of positive negotiations suffered a blow in Mont Pelerin as they de-cided to play hard-ball. It would be criminal to waste 16 months of hard work, marked by an unprecedented spirit of cooperation between the two leaders, which brought the two sides within reach of an agreement. The reality is that if President Anastasiades and Turkish Cypriot leader Mustafa Akinci do not find a way to break the deadlock over the next few days the best ever opportunity for a settlement would be lost for good. The situation can still be salvaged but it may require Ana-stasiades crossing some of the red lines he had drawn. For instance, it beggars belief that he was willing to wreck the procedure over the return of one village – Morphou. Now he may have to agree to go to a five-party conference without the territorial readjustments being final-ised and a range of other open issues in order to save the procedure. This may be the only way of salvaging the situation and not wasting what could be the last opportunity for a negotiated settlement. He has nothing to lose, except face, from agreeing to a five-party conference because if he does not the peace procedure would be halted. If he goes and does not secure a deal that would satisfy the majority of Greek Cypriots it would be rejected in the referendum but at least he would not have given up when a deal was so close. First, however, he would need to speak to the Greek government and demand that it adopts a more helpful stance instead of setting conditions for attending a multi-party conference. Un-fortunately even on Tuesday Foreign Minister Nikos Kotzias reportedly repeated Greece’s condition for the abolition of guarantees in a telephone conversation with Espen Barth Eide. There have also been reports about a meeting on the Cyprus talks between Greek Prime Minis-ter Tsipras and Turkish President Erdogan but these have not been officially confirmed. But regardless of what happens if Tsipras and Erdogan meet in 10 days’ time, Anastasiades needs to take the initiative before then if he wants to salvage the process in which he has in-vested so much time and effort, achieving so much. The UN will not do this for him and we doubt Akinci would make a move. It is up to the president save the process even if there is no face-saving way of doing this. Are you totally ignorant???? Are you aware of the hardships,racism and harassment those people in the Rizokarpaso enclaves have endured !!!! There are two stories here, the politically inspired media and talking to the actual people who live there, and remain there. That said, it has not been, until recently, easy for anybody who lives in that area, irrespective of language or religion. Not all enclaved are experiencing the situation as you describe it. I’ve met people living in that area since 1974, relatives of our neighbors and they didn’t express any serious problems. As for your two replies, can you please elaborate, since they haven’t any validity at all. Me, my wife and family have lost our properties in Varosha 1974. Were you even born at time? Yes I was born at that time and I did elaborate my statement by posting a link to you which has been removed by CM. If you Google human rights in Greek enclaves you will see your elaboration. Let’s separate two things, human rights and and how many of the enclaved are treated at present. Human rights have been violated since August 1974 and still is. That’s a fact which can’t be questioned. As for the treatment of the enclaved, I merely posted my own experiences based on the enclaved I met and spoke to as well as the information their relatives, who lives in RoC, gives me on a regular base after visiting their close relatives in Karpas. The years after the invasion and occupation were obviously very hard, but what the people I refereing to, are experiencing today is very different. Since many, many years they are going on well in general with their TC neighbors and don’t meet any harrasment or racism. Their biggest concern is what will happened with thier properties once they die, if not any of their relatives move in. The chance then is that the family will loose it for good. I’m sure or rather I know other enclaved have another experience all together. Morphou is just a village?The writer must be an alien whose spaceship must have strayed to earth.The area of Morphou is one of the most fertile lands in Cyprus renowned for its citrus groves and major exporter of oranges and grapefruit.An area which was overwhelmingly inhabited by Greek Cypriots.The word compromise may be key to a solution, but must we utter such absurdities? Have to agree with you, but if Morphou is just a village then why is the Tc not willing to let the gc residents back and give it back to gc admin? If Nik comes out all guns blazing tonite then he will kill the process, either way fact is if Turkey wants a solution there will be one….. Yes, but Anastasiades will not agree to anything that will not stand a reasonable chance of a ‘yes’ vote by the Greek Cypriots. Indeed the elusive yes vote, you are right, and am pretty sure they have done the sums and gone through different scenarios as to what results via the negotiations would lead to a yes vote…so you are sure that return of Morphou under gc is a game changer? or could as I have mentioned before other areas be returned instead that would make the numbers add up and result in a yes? I have no idea to be honest as am not privy to the inside workings of the negotiators. Irrespective of their own responsibilities for the Cyprus intercommunal conflict, the Greek Cypriots feel a great sense of injustice as a result of the Turkish invasion and the misery that ensued. Added to that is the factor of ‘resistance to change’.People are wary of taking risks to change the status quo they have been used to, for almost half a century.The yes vote is an elusive goal, as you very well described. I do not know what can trigger a change of heart of the Greek Cypriot mind, but what I do know is that Anastasiades takes serious note of AKEL’s stance, plus the fact that he constantly measures people’s attitudes, through opinion polling. They don’t want to give Morphou because of the revenue it generates from exporting citrus and other fresh produce. Two thirds of Cyprus controlled by,as it has always been , by a rich and elite minority exclusively Greek entity is far better than sharing with any ordinary Cypriot Greek , Turk or foreigner ! This is totally unacceptable. Turkey has played its last intransigent, provocative hand. Time for the big stick to come out now. Mr Anastasiades, no more Mr Nice Guy. It is time to dispatch at least three of our aircraft carriers, our arsenal of nuclear powered submarines and a multitude of F15s, F16s and F18s (unfortunately we do not have F35s yet due to delays at the manufacturer) and park them outside Istanbul and Ankara until Turkey meets our REAL demands. To get the hell out of Cyprus, taking with all their soldiers, settlers and even the TCs. Since after all they are not genuine ( meaning ”hellenistic”) Cypriots. As well as paying us at least €50 billion in reparations for their illegal occupation since 1974. Of course and before the ultra super patriotic commentators we encounter here start with their regular mindless drivel, this is a joke. A figment of imagination. But not dissimilar in scale to the inherent mindset that STILL prevails across the ENTIRE spectrum of the so called ”leadership” here and in our ”motherland”, Greece. Of unrealistic, non-pragmatic and frankly bizarre evaluations and expectations of what reality is. Which is unsurprising, since, as we have said before, this place lives on another, surreal planet. REALPOLITIK is an alien concept in this little place, whose ”leaders” believe that we are a superpower that can impose its will on just about every country. And that we are world hub for ”diplomatic” maneuvering (those sensible among us would refer to this as sheer lunacy) that the world is forced to pay attention to since we are a heroic, always at struggle nation and demand solidarity. In addition to being the centre of the known world which makes us the most coveted real estate known to mankind. How else can one explain these latest shenanigans by Anastasiades? Of snatching defeat from the jaws of victory? The fact of the matter is that we misunderstood Anastasiades. We believed that he wea a genuine Cypriot patriot. But in reality, when it came to the crunch, he flattered merely to deceive. -Was the return of 100,000 refugees under GC administration really achievable and realistic? And more importantly – as Frustrated states below -are there 100,000 living ”refugees” who wish to return? – Was it realistic to demand the complete scrapping of the ”guarantees”, even if after Turkey indicated it was prepared to review these? After all, was it not the great ”ethnarch” Makarios who accepted these in 1960? – is he prepared to prevent 70,000 refugees from returning because 15,000 Morphites cannot? – is he prepared to ensure that ALL 40,000 of the Turkish troops remain here because he does not want any form of security guarantees by Turkey? – what is our plan B in the event of these talks failing? What is our fall back position should Turkey proceed with annexing the north as a province? Resulting in us not getting back one square inch of territory? 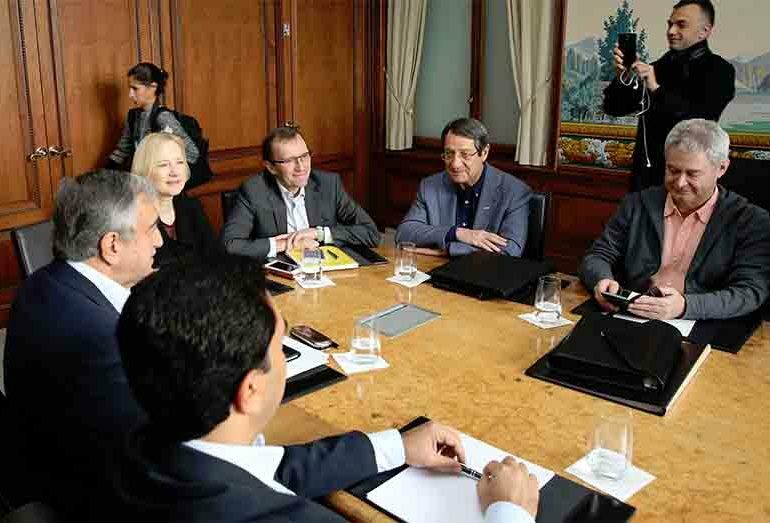 – why did Anastasiades ask for a week’s break at Mont Pelerin and then run off to Athens? And to meet up with such ultra nationalists such as Kammenos as well as the communist party who last week denounced a bi-zonal federation for Cyprus? – why did he waste so much time informing the local rejectionists of the status of these negotiations when he knows very well that they are against ANY solution? This breakdown is just another depressing and catastrophic chapter in the tragic history of this island. Of promising progress being made, only for us to find a way to ensure failure at the last moment. The super patriotic rejectionists – little Papadopoulos, Sizopoulos, Lillikas, Theocharous, Perdikis, the Archbishop and the rest – are all celebrating. For ensuring the latest disaster. The writer of this CM view is correct however. Anastasiades CAN save these negotiations. By getting AKEL firmly behind him, ignoring Tsipras, Kotzias (who is a Kremlin supporter) and the rest of these despicable characters and sit around the table with that genuine Cypriot patriot Akinci who actually defied Erdogan in his quest for a solution, and push for a FINAL realistic and pragmatic solution. He is that close to a settlement. Otherwise he will go down in history as another, in the long line, of dismal, cowardly failures who sat on the cursed presidential chair. Surely the answer is obvious/ Even for a populist, corruption riddled president such as him? Therefore we should justify the illegal invasion,occupation and hand over sovereignty to Turkey. The north of the island is internationally known as an illegally occupied area of a sovereign state. I am guessing you are not an ethnic Cypriot but I would like to ask you if you’re homeland had been invaded would you accept guarantees from the invading army for your security??? Well written and an absolute correct conclusion of the present situation and our options. But it will for sure be too much for some individuals to read and digest. Will he or won’t he?That is the big question?If Anastassiades really still believes that this last chance for a solution must not be lost he will make the right moves to get things back on track in the coming few days and ignore the rejectionists here who are waiting for every opportunity for him to fail,not just because they don’t want a solution but also-and mainly-because they know 2018 is not far away and they have their own ambitions!His previous behaviour has been erratic at times and it is hard to predict.Then we have Erdogan who perhaps decided long ago to impliment his plan B and therefore ensuring the negotiations fail is all part of his strategy?What a depressing scenario and enough to make anyone want to leave this place! What a terrible, terrible shame. Last chance saloon I’m afraid. Smooth diplomacy and pracmatism is needed now more then ever by both leaders. The question is if they have the ability and the boldness. Don’t back down as we did 2004, mainly due to the last minute turn around by AKEL/Christofias. The discussion of a settlement/agreement started way back in 1968. I don’t think there can be any hidden surprises any more. It’s now only a question of the will by all, to share this country for the benefit of all of us. Wasn’t it Papadopolous crying on TV that scuppered it in 2004? Absoulutely, it’s called crocodile tears and by far too many swolled it without any hesitation. But the big turn around was due to AKEL/Christofias. What a terrible, terrible shame and it would have so good for the island as a whole. But your best chance was the Annan Plan, and you blew that. Now it looks as though this latest effort is going out of the window. Well at least it gives the CM correspondent’s something to write about for the next 50 years. What a dire thought. Güzelyurt/Morfou will NEVER be given back to the Greek Cypriot side. And there will be “concrete” bizonality as has been agreed with many criterias/imitations as to “who” can move to the North post settlement. Why? Because there will be two Constituent States. Mr Anastasiades and Greek Cypriot officials “knew” all along what it was being negotiated. A new partnership state, federation (Denktaş’s idea). Apparently in a very positive progress they also agreed on the Council of Ministers Akıncı has said and backed by the hard liner nationalists in the North that there will be a Council of Ministers distribution of 7/4. So Turkish Cypriots get more than half the Ministries in the new partnership state, and a power of veto where at least ONE TC Minister has to give approval for something to pass. And all Turkish settlers with TRNC ID cards get to stay in Cyprus — another hard line nationalist supported element agreed in the talks. And the “property commission” to be formed post settlement will be based on making decisions on “agreed criteria” so the people living in a property today have equal/more rights (not less rights than the previous owner). First time the Greek Cypriot side has voluntarily accepted this. The Greek Cypriot side should wake up and smell the Turkish coffee, and get back to the table and SIGN the way forward for a referandum. I’m afraid that your personal “red lines” are exactly why the situation on the island has been grinding on and on: We WON’T do this, you WILL do that, Take it or leave it, etc., etc. I’ve been witnessing this confrontational way of doing things by the politicians and citizens of both sides ever since I was a teenager. And what exactly has this destructive mindset ever achieved? Absolutely nothing apart from painting a picture and confirming to the outside world that a childish bunch of basket cases live on the island. If indeed the politicians can’t compromise and get their act together, I for one hope that the UN packs up and departs for good. Enough is truly enough of this pathetic, puerile behaviour. I think I have asked you this before, are you a member of the Tc negotiation team? CM is telling it very much like what it is, as they have for the most of this process. Anastasiades may be afraid that giving up Morphou would have been turned down again in the referendum. The GC hardliners have got to see realities in the eye very squarely for a positive result to win through. Get the area under a generic federal umbrella…. Could it be that now Turkey is no longer pursuing membership of the EU and is now pivoting towards the Shanghai Cooperation Organization. I suspect this change in circumstance may well affect the peace talks. Kurtz…………….I too have been thinking along these lines. Kurtz…..I am thinking along those lines too. I can’t help but have a cynical attitude to this whole process. It was not going to and will not happen. The final decision on the division of Cyprus was made in 1974 and nothing is going to change it. There may have been some skullduggery at this time in international circles as to why the Turkish Cypriots became defacto, a rogue state; with no recognition internationality of their status and the only internationally accepted leadership for the whole of the Island became those so called elites in the Greek Government and Parliament. There have been opportunities in the past for the Republic to have gained more territory than that which is or was on offer, but the desire to get more overrode everything. Don’t blame the Greek Cypriots it is in their nature to take a Byzantine approach and I am not aware of any situation whereby Johnny Turk vacated territory unless it was at the point of a gun. That Greece, no longer wants to act as a Guarantor is understandable. After all what did they ever do in the past? Apart from meddle with disastrous consequences. The British? Well they have want they want don’t they – their last bit of Empire – perhaps they could give some territory back – they surely do not need it all. The Turks? They will never go back to the way things were. Send the UN and all those highly paid bureaucrats home (the 53 year holiday is no longer justifiable) and get on with life. But try and get on as good neighbours. Many countries have lost territory through war and I don’t suppose Cyprus will be the last. NOooooooooo! Please don’t tell me the massacre of those beautiful 100 year old trees on Larnaca St and the continued demolition of good citizens front yards as well as the shops whose customers risk ankle injury in order to get to them, all for the sake of the EU funded (to include an envelope for the multi-faced Mayor of Aglandjia) super highway now leading to…nowhwere…was all in vein…why, we already have plenty of highways to nowhere which is proven anytime anyone enters a Government building. LOL… Government buildings… the Hotel California in the Med. Why Mont Pelerin at all? Why talk when the republic really wants a return to pre 1974 status quo and no less. Whatever agreement is offered, Cypriots want their country back. But the past is another country – we did things differently then and no amount of talks will change what Cyprus has become – a permanently divided state. The thousands of protestors on Monday evening wanted anything but a return to 1974. Since the beginning of this recent negotiating process between the two communities, the public has been fed the line that it’s “Cypriot owned” and that no outside interference is involved or will be tolerated. With reference to an iconic quotation in the Clint Eastwood film, The Outlaw Josey Wales, “Don’t piss down my back and tell me it’s raining.” On numerous occasions both Anastasiades and Akinci have flitted off respectively to Athens and Ankara either to submit progress reports or else for advice as to how to proceed. We now have this projected meeting at the beginning of next month between Tsipras and Erdogan which will hopefully break the logjam. The fact of the matter is that the two sides aren’t a million miles away from an agreement and one final push will do it. As I understand, one of the sticking points is the number of GC refugees who would be allowed to return to the north. The reality is that nowhere near the requested figure of 90,000 would return anyway so the figure is academic. (And yes, I’m well aware that it’s the principle). Statesmanship has been lacking throughout the process with all this talk of red lines for this, that and the other and stipulations demanded before even sitting down at the negotiating table. This is hardly the way to behave. Anastasiades is hardly a Pericles or Venizelos and neither is Akinci a Suleyman the Magnificent or Mustafa Kemal Ataturk. In short, it very much looks as if the slogan “Cypriot owned” is going to be shown for what it is: a sham. When reading your sensible and level-headed comments, I rather wish Anastasiades and Akinci would assign you, Frustrated, to act as their intermediary with Greece and Turkey, who still seem intent to use Cyprus to score points off each other. Well, the sticking point at hour H, yeah. Then you have Morfou, the rotating presidency, the settlers, the Turkish soldiers (Akinci made it clear he wants a phased out, years long plan and wont let all of them leave at once) and the guarantees. Im not minimizing the progress that has been made in the past 18 months, but just like the so-called ‘reform process’ the South has embarked upon after the bail-in/out, the easy jobs have been done and the real issues face major sticking points. The discussions have entered the ‘red line’ phase now, and it clearly shows. Im not saying an agreement is impossible, but considering it would be taken to the people (and we know people tend to answer the wrong question during referendums) and that we’re entering a full presidential election campaign year, my hopes arent up at all. Why should Cyprus accept an unfair solution,the TRNC is a puppet state of Turkey which lest you forget ILLEGALLY OCCUPIES THE INTERNATIONALLY RECOGNISED REPUBLIC OF CYPRUS. If the Turkish Cypriots care about their future they should exert pressure on Turkey to end their occupation and intransigence to a solution. Turkey has said it will accept nothing less than 30% of the land,will not return Morphou to its original exiled refugee community and will not remove Turkish military from the island. Basically consolidating there occupation and you suggest we accept this ???!!! Why should 18% of the population have exclusive rights to 30% of the country??? And why do you at CM support this??? If the Turkish Cypriots prefer to be a province of the fast becoming Islamic fascist state of Turkey instead of being part of a progressive EU country with all the freedoms that entails so be it. The Cyprus Mail should be backing Anastasiades to get a Just solution NOT an Enforced and Unfair one. safer with turkey…. .whats eu? When the talks failed yesterday I was in a shop in Palmers Green London a well known grocery shop for GC’s I heard them talk and most breathed a sigh of relief I asked why to a group of people, they said look how can wee look at the TV news at night and hear the news that the President of the ROC Mr Mustafa so and so has visited so and so country we cannot accept this rotating presidency on the majority of the people. So when I heard this I came to the opinion that there is still a division in people’s mindset of Turkish & Greek I don’t care what I read anymore the older generation still have this ” Them and us” thought in their hearts. If you want a solution then there is only one man opps or woman what ever you want to call him to be President ” milo yiannopoulos ” he/she will offend all the people GC/TC and he/she doesn’t care. EU has human rights,freedom of speech and does not persecute and incarcerate based on ethnicity. Your comment is so stupid and so much shows how well you are brain washed. First of all even when theay are fast becoming islamic fascist state.. what is greece or Greek Cypriot? isnt it christian ? secondly isnt it according to your Christianity is the right religion ? or you will tell the world no Christianity is the only and right religion and muslims are terrorist in your stupidity not to understand that terrorist painted in muslim are just the Christians way of destroying Muslims and its Nations. the greatest problems is the Christians who are lost in illusions of the politics and power. and driving people like you on the wrong boat. Do not be worried. soon this Muslims will be your neighbor. and you shall see no peace in Cyprus for the rest of your generations. And you call his comments stupid!